Add a sun-kissed glow to dull, monotone hair with all-natural sun bleaching techniques. It's a safe way to create natural-looking blonde highlights using edible products from your kitchen. Harsh, over-the-counter bleaching products can leave hair brassy and brittle, and salon highlights cost a fortune with upkeep. So don't stress your tresses. Find out how to lift your hue without having to spend hours in the sun. Shampoo and then dry your hair. Decide which method is best for you, lemon juice or chamomile tea. Lemon juice is more acidic, so it will lift your hair more quickly. Because it works fast, it's best to use on hair that's already relatively light, such as sandy or ash blond. Chamomile tea works well on blonds too, but because it's less acidic, brunettes and red heads will love the caramel colors that it creates. There's less of a chance for brassy results if brunettes and red heads use chamomile. Mix two parts pure lemon juice to one part water in a spritz bottle if your hair is already fairly light and you've decided to use lemon. Steep a large mug of the tea and pour it directly into the spritz bottle after it cools off, if you've decided to use chamomile. You do not need to add extra water. Brush your hair the way you would typically style it or let it fall and part naturally. Then start spritzing your hair all over with the bottle held about six inches away from your. Blow-dry your hair completely and leave it in for about a half hour. Wash it out and repeat the process a couple times per week until you've reached the desired level of natural sun-kissed highlights. Pull hair back into a loose ponytail using your fingers if you want to add highlights only around the frame of your face. Spritz your crown, but do not douse the sides too much or the highlights will appear very unnatural. Blow-dry completely and leave it in for about a half hour. Wash it out and repeat the process a couple times per week until you've reached the desired level of natural sun-kissed highlights. Lighten up your hair after spritzing by going out in the sunshine if you have agreeable weather. 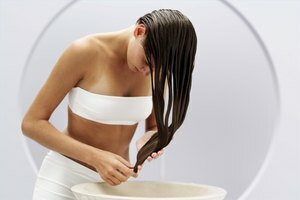 If you plan to sun-bleach for hours at a time, especially on your first time, keep an eye on how much your hair color is lifting. You don't want to bleach too quickly and turn out brassy. If you want to sun-bleach on the go, chamomile works for all hair types and it's a lot less sticky than lemon juice. It's also less pungent. Lemon juice is highly acidic and will sting if it gets spritzed too closely to your eyes.